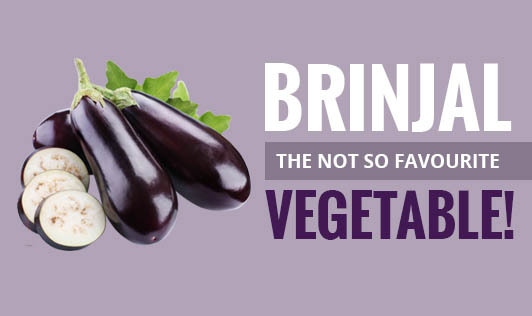 Brinjal- the not so favourite vegetable! • Eggplant is known to control blood sugar levels and the absorption of glucose due to the presence of fiber and low soluble carbohydrates. • It is known to reduce the risk of heart diseases by stabilizing blood pressure levels. • It contains phytonutrients that help protect the cell membrane of the brain from damage and ensures normal functioning of the brain. • Eggplant helps in weight loss due to it high content of water and low calorie count. • Its high fiber content prevents constipation and lowers the risk of colon cancer. • The B-complex vitamins present in brinjal such as pantothenic acid (vitamin B5), pyridoxine (vitamin B6), thiamin (vitamin B1) and niacin (B3) are essential in fat, protein and carbohydrate metabolism. • It reduces swellings of legs. • Brinjal is used as an antidote for mushroom poisoning. • Mashed eggplant or a soup made out of it helps reduce flatulence. • Soft baked eggplant with honey is known to induce sleep and hence, used to cure insomnia. It is sad to know that with so many health benefits, brinjal is one of the most disliked vegetables among kids and adults. It is high time that people realize its benefits and start eating it in some way or the other.